Deep learning, the mainstream artificial intelligence research topic is using a lot of computing resources like GPU, FPGA, and ASIC. We need to handle this resources efficiently in the cycle process including continuous using, getting feedback, doing update the models. 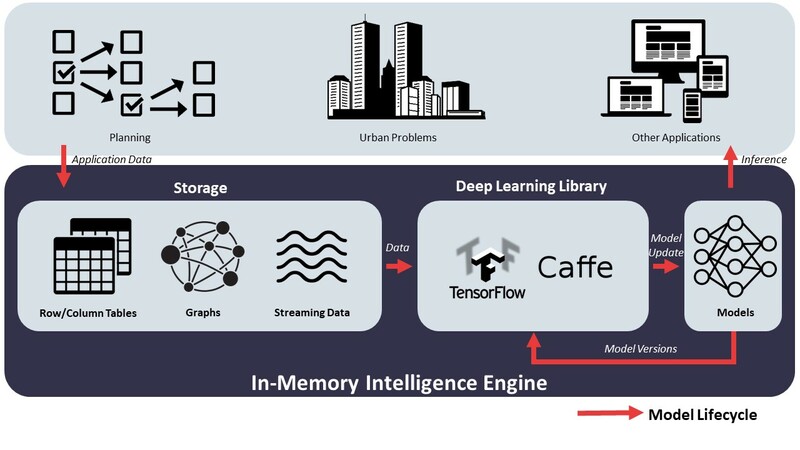 The goals of this research are 1) to define the lifecycle of deep learning model and data, 2) to find some engineering problems in the lifecycle management and 3) to implement the management system. The goal of this research is to tightly integrate deep learning libraries into our data processing platform. Data collection and preprocessing is performed in this single framework without overhead. This approach can contribute to optimized performance by removing unnecessary data movement and alleviate complexity of big data analysis system. Air pollution is an urgent problem in South Korea. It is caused by many factors such as transportation vehicles, industrial plants, China impacts, and so on. Datasets : collect hourly air pollution data from monitoring stations around major cities. Use Recurrent Neural Network (RNN) Encoder-Decoder model with an attention layer. Combine both Air pollution values and Weather data in the model to predict ahead 8 → 24h Air pollution value. Planning is the process of thinking about and organizing the activities required to achieve a designed goal. When executing the planning, we move from the initial state to many different states to reach the goal state. Our objective of research is to find the best path to move from initial state to the goal state. By collecting automatically and in real-time actual execution logs, combining with analysing historical execution data, we could apply machine learning and/or deep learning to predict the best path for planning execution. This joint project is conducted with Seoul metropolitan government to solve urban city problems about air pollution, environment, traffic. To achieve this goal, this project introduces deep learning model to learn the patterns of each problem and get possible solutions. To build rich real-world data set, this project also develops a mobile edge which have various sensors, collecting real-time data while moving around Seoul. The goal of this research project is bulding an 1 PF(Petaflops) scale High Performance Computer(HPC) with calculation nodes consist of various accelerators such as GPU, Intel Xeon Phi, FPGA. To support softwares run efficiently on that system, we need back-up engines named BDBC(Big Data Big Computing) engines; 1) snapshot manager for fault-tolerance, 2) data lifecycle manager for optimizing and managing memory usage and 3) graph library as a distributed system for large size graph(|E| >= 1B) processing. This project is funded by the Ministry of Trade, Industry and Energy. In this project, we construct the driving video data management system which processes raw driving data to a deep learning training dataset. To make a dataset can be used in a training step of a deep learning model, we make some data processing functions such as attribute editor, driving video split method and annotation labeling system.